ONE SATURDAY AFTERNOON I stopped at a cemetery. The graveyard was small and most of the tombstones were dated before my 98 year old grandfather was born. I don’t know who Mary Fisher was. For me her entire life is contained in the dash between those two numbers: fleeting, fragile, empty. I am not aware of the circumstances of her death. I only knew in that moment that I did not want that epitaph on my grave. I did not want my name and then the words “deeply regretted” tagged onto the end. Imagine having your entire life summed up by the words: “deeply regretted”? Not intensely loved. Not dearly beloved or greatly missed. Not enthusiastically lived. Not a whisper of a life embraced with vivacity and animation and love. How to breathe life in and shout it out? How to keep a soul fertile to changes, places, people and God? How to laugh often and much, yet weep with strangers? How to face decisions that could change everything? 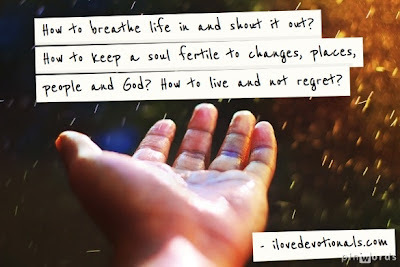 How to live and not regret? I realised that there is so much in our lives that steals and destroys, so much that can make us live with regrets but that Jesus didn't come for us live with regret. Jesus came that we might have life: life to the full. Allowing ourselves to dwell on regrets steals from the life Jesus came to give us. If we do want to live fully, without regrets, we have to believe that Jesus has come to give us new life. We have to look at the mistakes we've made, accept the consequences and find a way to bring life back into them. Maybe this means apologizing, or telling someone you love them or trying something you fear. Perhaps living without regret means sacrificing something you love or finding a way to shake a habit or radically changing your life or forgiving someone who hurt you. Whatever it is, take the risk, and trust that God will hold you. I don't know what you regret but there is nothing in your life that God cannot fix so don't allow regret to steal from the life he has given you to live. What changes do you need to make in your life today to make sure that you are living life to the full?